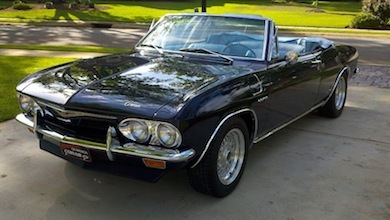 I have heard a LOT of Hearsay about center-mount 4 barrel set-ups on Corvairs. The biggest negative that keeps getting reported is, . . .
"You can't run them when the temps drop below 50° because they will ICE UP!" Well, I truly do not know what to make of this statement. My (still new to me) '67 Moredoor came with a Holley 390 on a Center-mount manifold, and I have not had any problems with it yet. Temps have been below 50° for a couple months now, AND . . .
We have been having an extremely COLD week (for us) with temps staying below freezing ALL day. 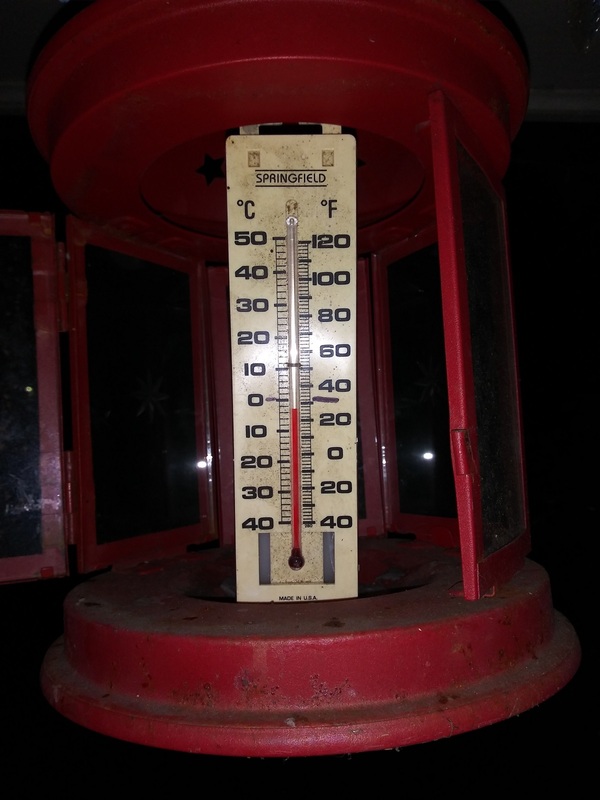 My front porch thermometer was reading 22° when I went to work this morning. It had dropped to 20° when I came home for lunch. And it had risen to a Balmy 26° when I got home tonight! This is the 3rd. vehicle that I have run with a center-mount. The Moredoor, a PG, and the other a 4spd., no terrible issues to report. No PICS, or it didn't happen right? OH! And just for the record, as I was writing this I went outside and checked, . . .
Yep, it still has the Summer cover in place. I forgot to open it this fall! I've only experienced icy carbs when the air is still very humid and the moisture touches the even colder carb. I'd say just the heat of the air around the engine would prevent icing. I can't say that I have ever had carb icing on a center mount, actually I have on the outside but not noticeable/detrimental on the inside. I have had regular Corvair carbs ice! That happens more on the FC's unless you have the shields for the carbs installed. When I ran a centermount, I only had ice on one occasion and it was cold and very humid. My 6-tube Holley 390 manifold on my road racing car is very cold to the touch even on a hot summer day. When we ice raced a center mount 4-leg Holley we ran warm air to the air cleaner with a Ford thermostatically controlled air cleaner. Both worked well. 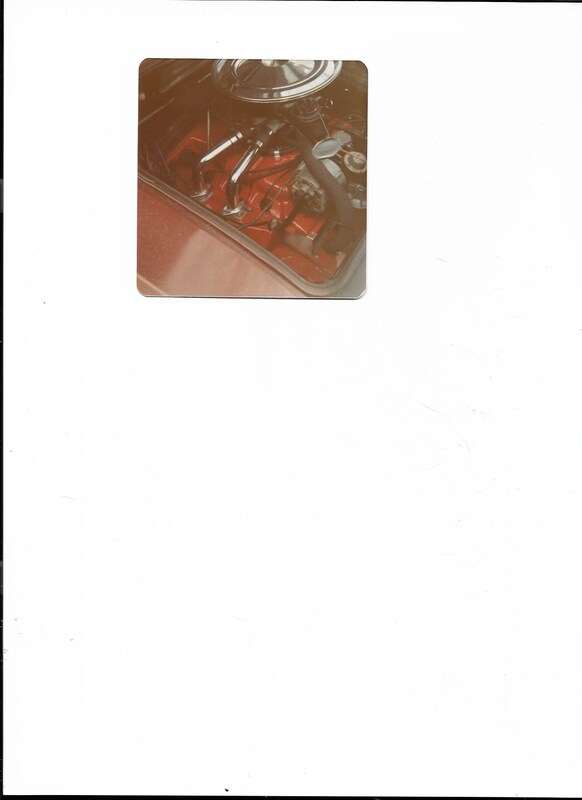 On the road racing car I did some testing with warm air to a different air cleaner but never really ran it. There can be some very cold races in the Spring and Fall. As I understand it, the cold manifold is caused by fuel that comes out of suspension and then evaporates again. The fuel tends to come out of suspension when it makes a turn. 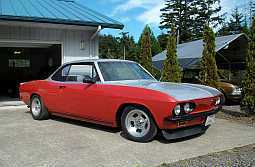 There's 2 or 3 right angle turns the air/fuel mixture has to make with a center mount on a Corvair. I have 3 or more 4-leg manifolds with different carburetors that I'd like to research when I can find the time with an eye to warming when needed. I'm glad you're having good fortune in cold weather. Sometimes as a group we get caught up in a story like carburetor icing and turn it into tradition or rule of thumb without due course. 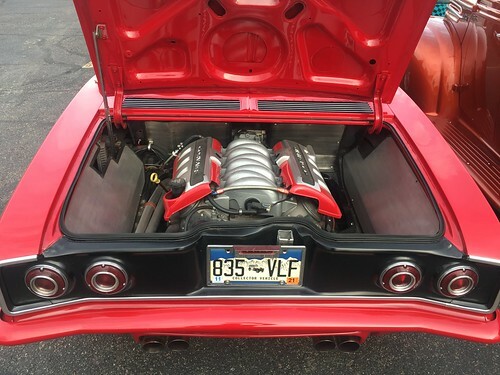 When daily driving Corvairs through Minnesota winters, I would run a LM air cleaner getting it's air through a hose routed above the damper door on the right side. I could just move or remove the hose when we were having a heat wave. I also used a "Chevelle with AC" heater fan running off a relay but that's another story. Back in the Seventies when my car was first put together in Grand Forks, North Dakota, Ben Adam's shop came up with this solution. (Anybody that races in eastern N. Dakota or northwestern Minnesota knows Ben.) A substitute cover for the hot air vent below the oil cooler was fabbed, with a small snorkel. A flexible hose connected that to a generic GM four barrel air cleaner. I believe the thermostatic flapper in the air cleaner snorkel was propped open. I don't recall ever having problems with icing with this setup. The four barrel setup was sold after my Air Force discharge, jobs were hard to find in 1980. I had and used a couple of 4-bbl conversion cars when I lived in Southern California. The Solar Sprint (Holley 390) never missed a beat; it was very well dialed in and had no crutches to keep the tubes warm but it was used mostly in the much warmer L.A. Basin. A '66 Corsa convertible I had for a while also had a 4bbl (AF but at that time I was living in a cooler, fog-ridden apartment on the ocean. That car was miserable and the chilly manifold tubes were frequently covered with condensation. Driveabilty below 2000/2500 rpm was basically not there. I currently have a set of manifold tubes that actually rusted-out due to condensation. I guess it's safe to say 4-bbl conversions are a mixed bag and no doubt relative humidity and dew point factor into their success or failure. I definitely think it's a humidity thing. I had 2 different 140's with center-mounted Quadrajets and drove them 365 days a year while going to college in Utah. it got plenty cold but humidity is very low. Never had any issues at all. The only real issues I had with the Holley 4 my dad put on our 68 when I was a kid was lag when you opened the throttles, maybe too much CFM? and the poorly designed cable that kept breaking under the car. I still like my 4 1 barrels better based ion that experience. I had a '76 VW Rabbit that would ice up in high humidity/cold weather. Driving between Boise, Idaho and the University of Idaho in Moscow during the winter in the early '80s was always an adventure, because the doggone thing would freeze up solid. My '61 Dodge D100 with a long runner slant six intake has a great solution for this, which is a physical connection to the exhaust manifold at the base of the carb, to heat the air/fuel mix. I solved the Rabbit problem by selling it. > but it needs a rich mixture to achieve even that. Just curious, what's you opinion on the 6 into 1 intake with the 750 quadrajet? These ports have a ram effect to help out, and the 750 has small primary's. Still don't have mine on the road. I am planning on plumbing hot oil around the base of the intake to fight the icing problem. He used a 2 part Epoxy to bond it to the bottom of the plenum. Car is driven a ton and never an issue. Its just run off a switched 12V on the harness with an inline fuse and a switch under the dash. Extra oil lines and fittings.. no thanks.. 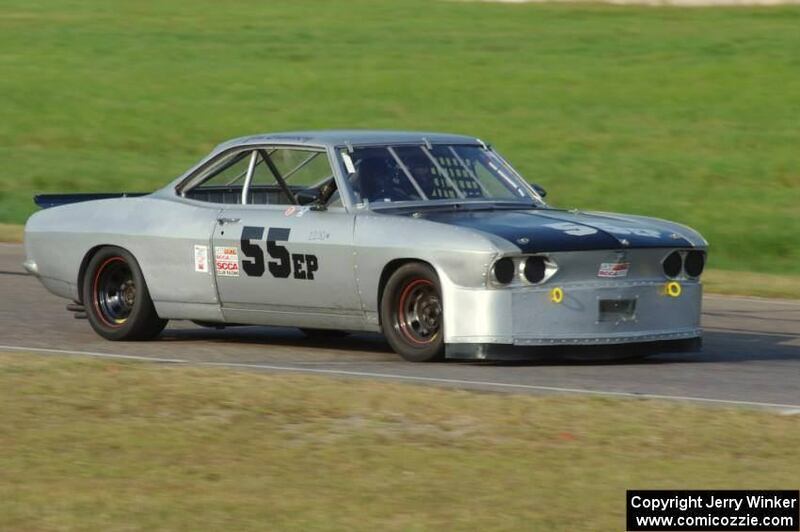 Some of you forget that the corvair world is a LOT bigger then this forum. I have NO, ZERO, ZIP, ZILCH, NADA, NOTHING, per-heating my intake. I do not even have the Summer cover removed. Nuttin but cold air in my engine compartment! We have been experiencing temps in the twenties, with highs hovering right around freezing. As for moisture in the air, I live about a mile from Puget Sound, and work at our local marina, yeah, I am near the water! I don't need no new-fangled high-tech plenum heater, oil an old school oil heated one. And to quote a recent poster on this thread, "Car is driven a ton and never an issue." 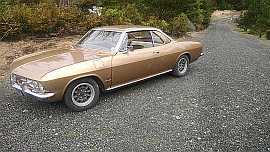 I don't think that anyone on here has even begun to imply that there is no world outside of Corvair Center Forum. But those of us in the know, acknowledge that it is called "Corvair CENTER Forum" because the world/universe revolves around CCF ! ! ! > I helped a friend do a Center mount on his 140. > with an inline fuse and a switch under the dash. > Extra oil lines and fittings.. no thanks..
> bigger then this forum. Fuel volatility has increased since the days of open vent carburetors and fuel tanks. This is why our open vent carburetors dry up in a few days. With today's closed systems, increased volatility allows an engine to start easily and has emissions benefits. I wonder if this volatility is helping to prevent fuel mixture condensation inside the cool intake tubes? 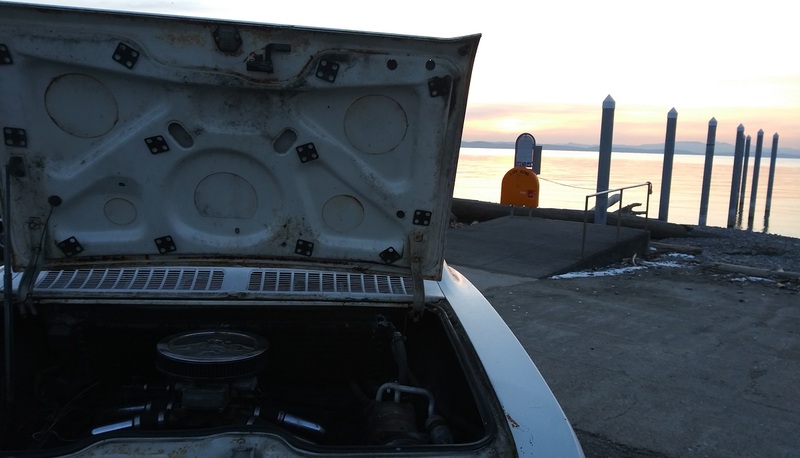 I wouldn't expect any difference in external water-vapor condensation but increased volatility might be why central-carburetor driveability seems better these days. Is Holley hybridizing their traditional style with others (small primaries, huge secondaries, fuel bowl gasket on top)? 625 cfm seems like a lot but since it has small primaries/big secondaries it seems somewhat like a Quadrajet to me.